Christmas Day is now exactly a week away, so I thought I post the picture this evening, not yesterday (although for my German readers Heiligabend, Christmas Evening, is the big event). 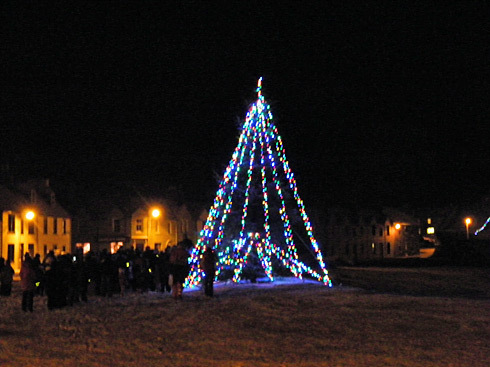 The picture shows Carol Singers around the tree in Port Ellen when the lights were switched on, a nice cooperation between the distilleries there. The lights are courtesy of Diageo (Lagavulin, Port Ellen Maltings, Caol Ila) while the tree is from Laphroaig. The people are of course from Islay (may be with a few visitors mixed in). That's all I have for today, I hope you're having a nice weekend before the big Christmas weekend.